I wish you a wonderful Wednesday morning! One of my favorite supergroups in the late 60ies and in the 70ies was “Led Zeppelin”, famous for their charismatic vocalist Robert Plant and the super guitar heroe Jimmy Page. Led Zeppelin were an English rock band formed in London in 1968. The group consisted of guitarist Jimmy Page, singer Robert Plant, bassist and keyboardist John Paul Jones, and drummer John Bonham. The band’s heavy, guitar-driven sound has led them to be cited as one of the progenitors of heavy metal. Their style drew from a wide variety of influences, including blues, psychedelia, and folk music. After changing their name from the New Yardbirds, Led Zeppelin signed a deal with Atlantic Records that afforded them considerable artistic freedom. Although the group were initially unpopular with critics, they achieved significant commercial success with albums such as Led Zeppelin (1969), Led Zeppelin II (1969), Led Zeppelin III (1970), Led Zeppelin IV (1971), Houses of the Holy (1973), Physical Graffiti (1975), Presence (1976) and In Through the Out Door (1979). Their fourth album, which features the song “Stairway to Heaven“, is among the most popular and influential works in rock music, and it helped to secure the group’s popularity. Page wrote most of Led Zeppelin’s music, particularly early in their career, while Plant generally supplied the lyrics. Jones’ keyboard-based compositions later became central to the group’s catalogue, which featured increasing experimentation. The latter half of their career saw a series of record-breaking tours that earned the group a reputation for excess and debauchery. Although they remained commercially and critically successful, their output and touring schedule were limited during the late 1970s, and the group disbanded following Bonham’s death from alcohol-related asphyxia in 1980. In the decades that followed, the surviving members sporadically collaborated and participated in one-off Led Zeppelin reunions. The most successful of these was the 2007 Ahmet Ertegun Tribute Concert in London, with Jason Bonham taking his late father’s place behind the drums. Led Zeppelin are widely considered one of the most successful, innovative, and influential rock groups in history. They are one of the best-selling music artists in the history of audio recording; various sources estimate the group’s record sales at 200 to 300 million units worldwide. With RIAA-certified sales of 111.5 million units, they are the second-best-selling band in the US. Each of their nine studio albums placed in the top 10 of the Billboard album chart and six reached the number-one spot. They achieved eight consecutive UK number-one albums. Rolling Stone magazine described them as “the heaviest band of all time”, “the biggest band of the Seventies”, and “unquestionably one of the most enduring bands in rock history”. They were inducted into the Rock and Roll Hall of Fame in 1995; the museum’s biography of the band states that they were “as influential” during the 1970s as the Beatles were during the 1960s. Here´s one of my all time favorite “Led Zeppelin” songs. and here´s their first megahit from 1969. Kashmir recorded 1975 was one of their biggest hits ever with exceptional guitar riffs played by Jimmy Page. Here´s a live perfprmance recorded after their reunion 2012. Kashmir later became the title song of the cult movie “GODZILLA” in a version called “Come With Me” ft. rapper Puff Daddy. Another supergroup of the 70ies was “Black Sabbath” with their legendary front man Ozzy Osbourne who bacame a superstar of rock music until today. John Michael “Ozzy” Osbourne (also known as The Prince of Darkness) (born 3 December 1948) s an English singer, songwriter and actor. He rose to prominence during the 1970s as the lead vocalist of the heavy metal band Black Sabbath. He was fired from Black Sabbath in 1979 and went on to have a successful solo career, releasing 11 studio albums, the first seven of which were all awarded multi-platinum certifications in the US. Osbourne has since reunited with Black Sabbath on several occasions, recording the album 13 in 2013. His longevity and success have earned him the informal title of “Godfather of Heavy Metal“. Osbourne’s total album sales from his years in Black Sabbath, combined with his solo work, is over 100 million.As a member of Black Sabbath, he was inducted into the Rock and Roll Hall of Fame, and he was inducted into the UK Music Hall of Fame as a solo artist and as a member of the band. Possessing a distinctive singing voice and as a native of Birmingham, Osbourne is known for his strong Brummie accent – he has a star on the Birmingham Walk of Stars in his hometown as well as the Hollywood Walk of Fame. At the 2014 MTV Europe Music Awards, he received the Global Icon Award. In 2015 Osbourne received the Ivor Novello Award for Lifetime Achievement from the British Academy of Songwriters, Composers and Authors. In the early 2000s, Osbourne became a reality television star, appearing as himself in the MTV reality show The Osbournes, alongside wife and manager Sharon and two of their three children, Kelly and Jack. He currently co-stars with Jack and Kelly in the television series Ozzy & Jack’s World Detour. The show’s third season debuted in June 2018. Here´s the song “Black Sabbath” from the first album of “Black Sabbath”, composed by guitarist Tommy Iommi. Anthony Frank Iommi (born 19 February 1948) is an English guitarist, songwriter and producer. He is lead guitarist and one of the four founding members of the heavy metal band Black Sabbath. He has been the band’s primary composer and sole continual member for nearly five decades. And here´s my all time favorite song of Ozzy Osbourne. Here´s Ozzy Osbournes biggest hit of the last years. Finally a song with an exceptional solo of his long term guitarist, guitar legend Zakk Wylde, one of my all time favorite guitar heroes. Back to the 60ies the most famous band besid “The Beatles” and the “Rolling Stones” was “The Who” ft. the charismatic singer Roger Daltrey and guitar legend Pete Townshend. The Who developed from an earlier group, the Detours, and established themselves as part of the pop art and mod movements, featuring auto-destructive art by destroying guitars and drums on stage. 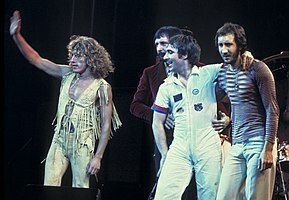 Their first single as the Who, “I Can’t Explain“, reached the UK top ten, followed by a string of singles including “My Generation“, “Substitute” and “Happy Jack“. In 1967, they performed at the Monterey Pop Festival and released the US top ten single “I Can See for Miles“, while touring extensively. The group’s fourth album, 1969’s rock opera Tommy, included the single “Pinball Wizard” and was a critical and commercial success. Live appearances at Woodstockand the Isle of Wight Festival, along with the live album Live at Leeds, cemented their reputation as a respected rock act. With their success came increased pressure on lead songwriter Townshend, and the follow-up to Tommy, Lifehouse, was abandoned. Songs from the project made up 1971’s Who’s Next, which included the hit “Won’t Get Fooled Again“. The group released the album Quadrophenia in 1973 as a celebration of their mod roots, and oversaw the film adaptation of Tommy in 1975. They continued to tour to large audiences before semi-retiring from live performances at the end of 1976. The release of Who Are You in 1978 was overshadowed by the death of Moon shortly after. Kenney Jones replaced Moon and the group resumed activity, releasing a film adaptation of Quadrophenia and the retrospective documentary The Kids Are Alright. After Townshend became weary of touring, the group split in 1982. The Who occasionally re-formed for live appearances such as Live Aid in 1985, a 25th anniversary tour in 1989 and a tour of Quadrophenia in 1996–1997. They resumed regular touring in 1999, with drummer Zak Starkey. After Entwistle’s death in 2002, plans for a new album were delayed. Townshend and Daltrey continued as the Who, releasing Endless Wire in 2006, and continued to play live regularly. Here´s their song which influenced a whole generation and the beginning “Mod” movements. I want to finish my story of today with “The Who” live at the legendary Woodstock festival 1969. I wish you a successful Wednesday an come back tomorrow with more legends of rock music. Bonustrack of today: The Jimi Hendrix Experience with a Bob Dylan song, Hendrix plays his legendary left hand Fender Stratocaster guitar with a “Wah Wah pedal”..